Although I've been to Munich quite a few times, I'd never explored the northwest corner of the city until a work-trip this past week. And what a discovery that was! 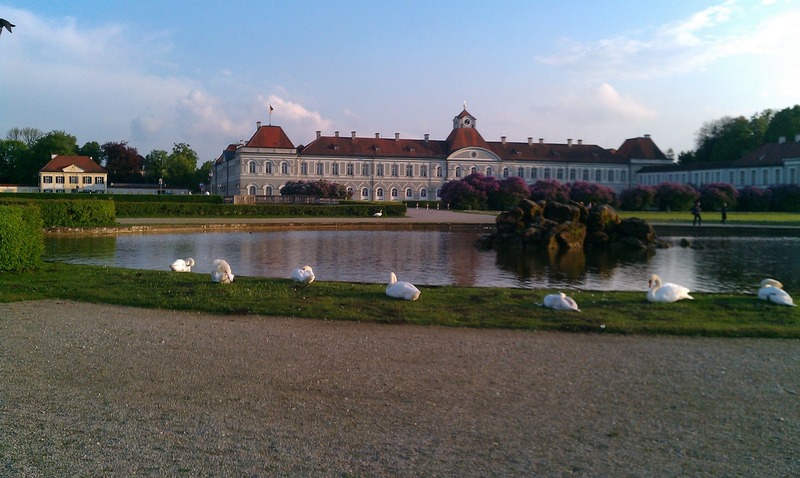 I ran through the palace grounds of Nymphenburg, which is one of the most delightful places I've ever run. Nymphenburg: those lilacs smell incredible! The palace has a huge grounds, about 200 hectares, full of gardens, woods, villas, meandering streams, lakes, little waterfalls, grand fountains, statues and canals: everything you need to keep up your interest at every turn. 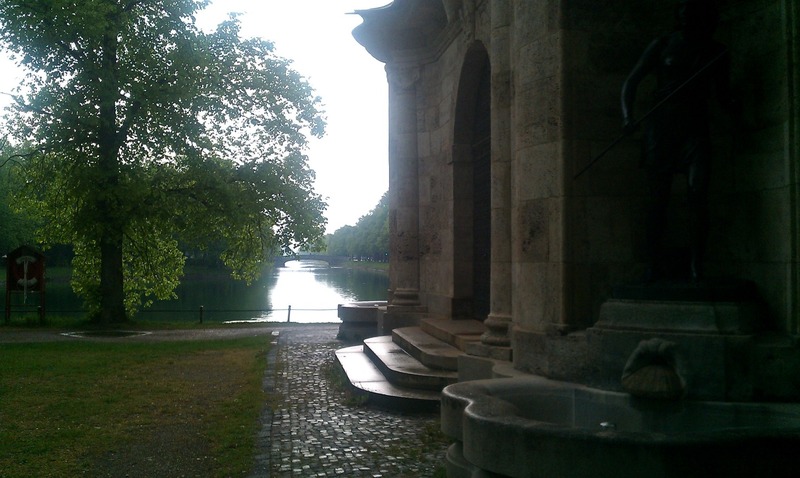 In places, it looks a lot like Munich's Englischer Garten. 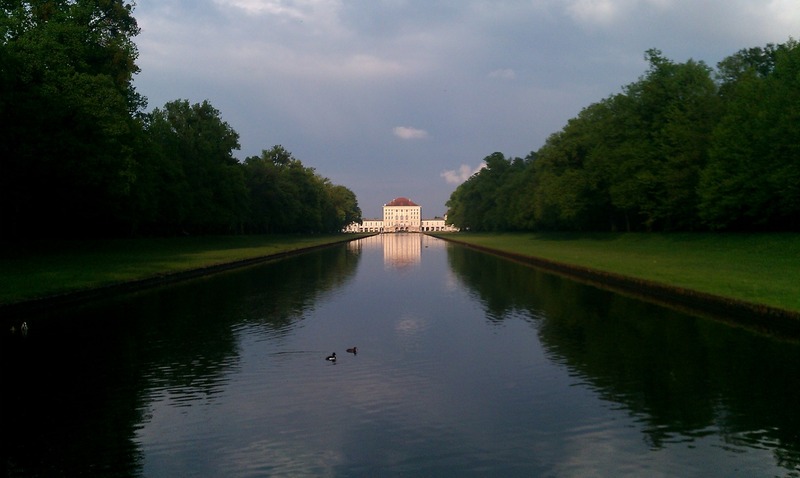 Nymphenburg was first built by Bavarian King Ferdinand in 1663 as a summer residence, and it was continually extended for long thereafter. A canal forms the scenic approach to the palace, providing a gradual and respectful entrance, and continues behind it through the park grounds. 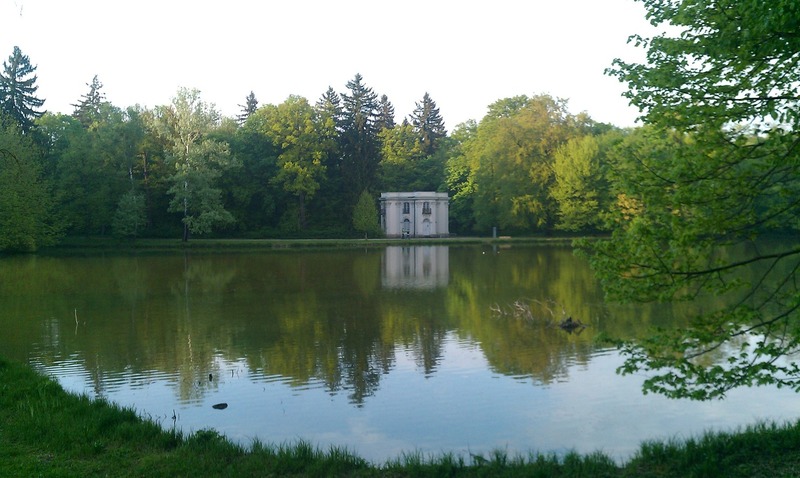 This route will begin at the east end of the canal, at Grünwald Park, in the villa neighborhood of Gern. It is just a block south of the Gern U-Bahn (U1) station on Waisenhausstraße. Begin at the temple-like Hubertusbrunnen decorating the end of the canal, and head up the Auffahrtsallee (there is one on each side of the canal) towards the palace, 1.5 km in the distance. The canal heads directly to the front door. When you get to the palace, you will run around a pond in front of the main palace building. Just keep running towards the central building and enter the park on either side of the building. NOTE: The park is closed at night, anywhere from 5:30 pm in December to 9:30 pm in the summer. 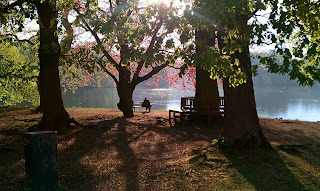 See the park website for the exact opening times. Exactly where you run in the park is up to you. You can't get lost: the whole thing is walled-in. The main canal and fountains run straight back from the palace, and several winding meadows also head west, parallel to the canal. Run straight through the sculpture garden behind the palace, staying on the right side. 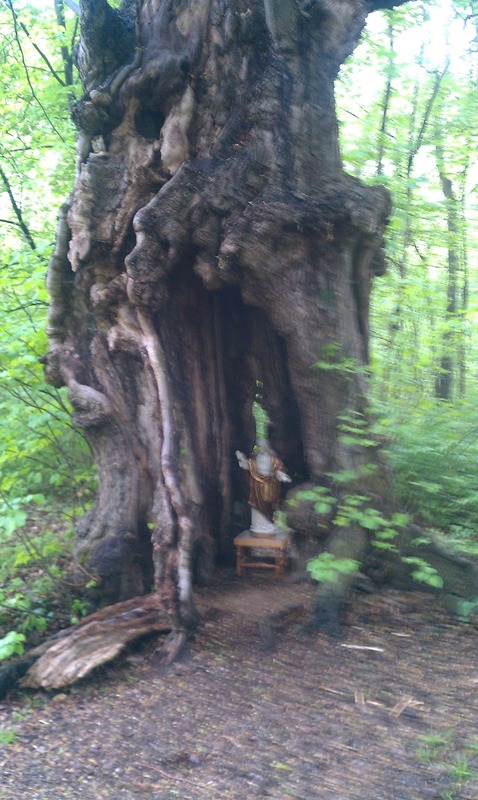 Then, when you cross the little side-canal, follow the path that branches to the right, going through the woods. This soft path ends up following the park wall along the north side. The view of the wall isn't so nice, compared to the rest of the park, and soon a loud street outside gets annoying. I would recommend turning to the left when you get to the gate at the loud street (Amalienburgstraße) and head into the park, along the stream. Turn right at the first chance, and follow that trail all the way to the fountains on the main canal. There is a great view back to the palace here. Cross the canal at that point and run to the next little lake and follow the south bank of the lake to the Badenburg. 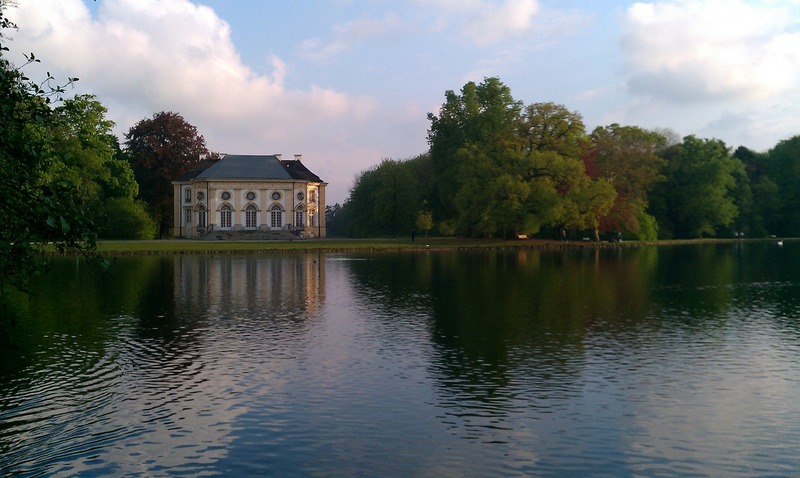 Badenburg is a lakeside party-house that must have make quite a venue. At the Badenburg, turn right and run a small loop to the south around a meadow there for some extra distance, and follow it back north as it crosses one canal and then leads you back along a stream to the main canal. 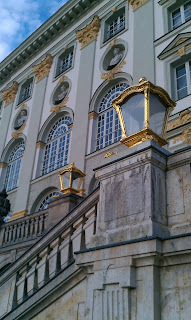 At the main canal, you will see the palace again, just to the right, across the sculpture garden. Run back to the palace, exit the park as you came and then follow the canal again as it leads you back to Grünwald Park. Maybe run on the other side of the canal, just for something different.